It’s not every day we get to fly out to Rwanda to meet interesting folks like Alexis Miesen, a founder of the Blue Marble Ice Cream company in New York City. We met up with her there – a country torn apart by the Rwandan Genocide, in 1994, but now in recovery. Miesen and co-founder Jennie Dundas, in 2013, helped a group of Rwandan women open the first ice cream shop in the country, providing them with support. Returning since then, Miesen told us about her experience, why she loves Rwanda and traveling, and the non-profit arm of the company, Blue Marble Dreams, all while a group of all-female drummers played next to us. We sat outside the shop, on a porch, with the bright sun casting a warm glow over us. The town we were in is rural, and there seemed to be a positive vibe about the place. Miesen was clearly happy to be back. Except, none of this actually happened. What we described was a short virtual travel experience using a Samsung Gear VR (virtual reality) headset and stereo headphones, inside a suite at the Marriott Marquis in New York City. Called “VRoom Service,” the collaboration with Samsung, launched on September 9, is Marriott’s second experiment in creating virtual travel. It’s a follow-up to the elaborate “sensory experience” (the Marriott Teleporter) the company unveiled in 2014, involving the Oculus Rift headset, a custom-made booth with a vibrating floor and air vents, and 4K, 360-degree video content. 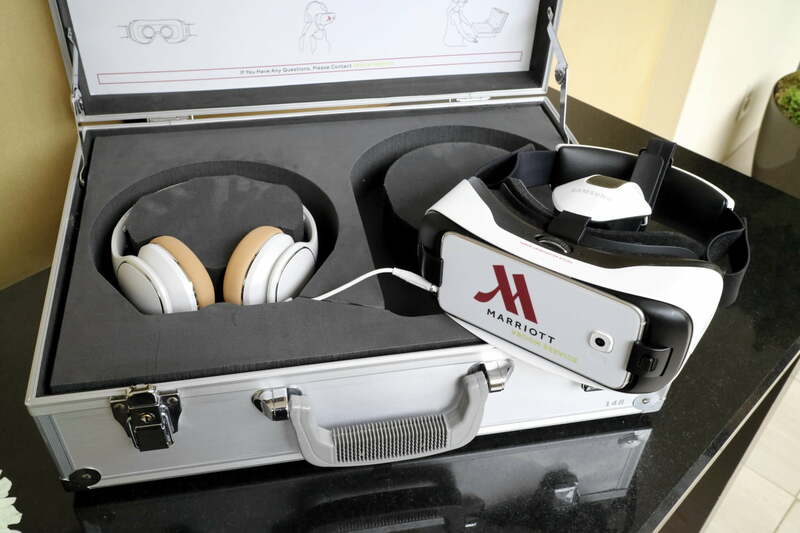 A year later, with the arrival of the Gear VR, Marriott was able to downsize the hardware to devices that can fit inside a briefcase. Unlike the Teleporter, which required assistance from handlers, the Gear VR experience is a self-service affair. While VRoom Service is also about transporting you to a new destination, this is technically a new experience and lacks the 4D sensory stunts. But it’s far more portable, economical, and easier to deploy: Using a special hotline or via Marriott’s Mobile Request smartphone app, a Gear VR can be delivered to a guest’s room for a 24-hour loan. The equipment is also set up in the lobby areas of the Marquis, where it’s being tested. 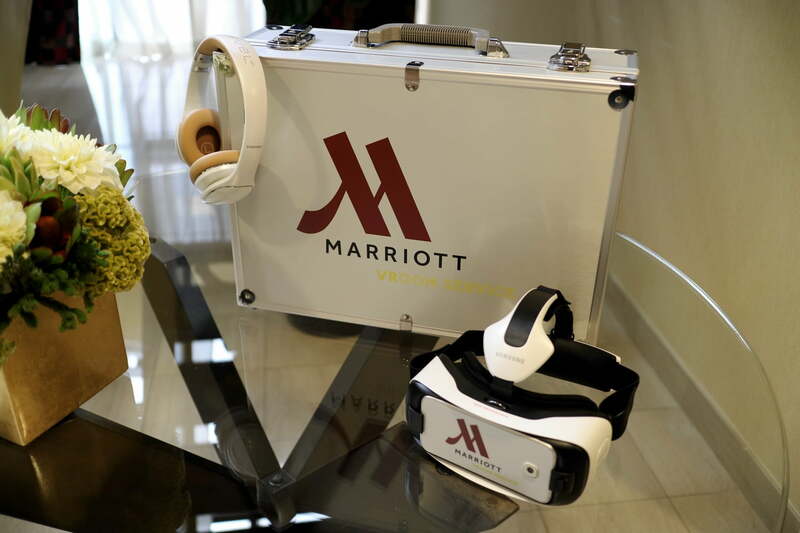 If Marriott’s first go was to test the VR waters, then the second attempt is a demonstration of where VR as an application can go next for virtual travel outside the traditional computing space. For VRoom Service, creative agencies Relevent and Framestore – which developed the previous implementation for Marriott – created three 360-degree content, called “VR Postcards.” In each short video, the user enters one of three scenarios: Beijing, Andes Mountains in Chile, and in aforementioned Rwanda. A real traveler, who also happens to be an influencer, serves as tour and guru – Miesen in Rwanda, for example. As the guides direct your attention to, say, the dumpling makers behind you or the Andes peaks in front, and tell you about what travel means to them, you are free to pan around and observe everything that’s happening. For the real Miesen, who we spoke with during Marriott’s launch event, it was her first foray into VR. But, for the types of trips she goes on and the causes she believes in – the rebuilding efforts in Rwanda and, now, in Haiti – Miesen thinks virtual travel can help better narrate the experiences she wants to share. “The humanity, it’s hard to touch and feel if you aren’t there,” Miesen says. “The capacity of VR to inspire empathy is unmatched.” With Rwanda, a country that most people can’t pinpoint on a map or only know from its troubled history, Miesen says the ability to bring people there virtually can instill the feeling that there is hope. On the flip side, she says, VR can bring us to places that are no longer safe to travel in. Michael Dail, Marriott Hotels’ vice president for Global Brand Marketing, is amazed at how quickly technology has changed, but from the travel standpoint, the latest iteration allows the company to not only scale VR to a greater degree, it helps tell a story “because travel is inspirational,” he says. Virtual tours “can help you make better travel decisions,” not just the feeling of being somewhere else. As more of its guests have access to what is expected to be the next big thing in imaging, Marriott is playing a role in developing content. VRoom Service is still part of a bigger and continuing experiment, and while Dail has no information about future plans to share, it seems Marriott does want to keep trialing new VR technologies. “Millennials are not only guests but co-creators in developing content,” Dail says. “They could be creating their own VR postcards” in the future.